New limits: The Planning Commission has proposed fixing the floor price of urea at $370 per tonne and the ceiling price at $470 per tonne. HT Photo. 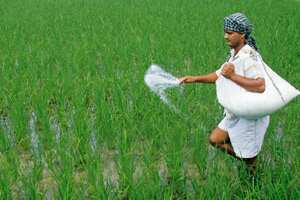 New Delhi: The Planning Commission has made a series of suggestions to the fertilizer ministry on how the urea sector can be revamped to attract investment. Two ministry officials said these suggestions were communicated by the apex planning body in a note floated during a meeting on 27 October. Both declined to be identified. Under the investment policy implemented in September 2008, the floor and ceiling prices of urea have been fixed at $250 and $425 per tonne, respectively. The ministry has been mulling changes to the policy as it has failed to attract new investment to overcome the shortfall in domestic urea production. About 22 million tonnes (mt) of urea is produced in the country against an annual requirement of 27 mt. The balance is imported. Officials said instead of linking the manufacturing price of urea to the price of natural gas, the Planning Commission has suggested that a constant price of gas should be considered on gas procured both via long term contracts as well as on the international spot market. Gas is the main feedstock for urea, and accounts for 70-80% of its cost of manufacturing. In its note, the Planning Commission has assumed long contract gas price of $4.8 per million British thermal units (mmBtu) and a spot price of $10.5 per mmBtu. The Planning Commission’s stance is at variance with a proposal mooted by the fertilizer ministry, in which it had said that the ceiling price should be linked to gas price. Mint had first reported this on 19 August 2010. The ministry had proposed fixing the floor price for urea at $275 a tonne, the ceiling price at $405 per tonne, while linking both to the price of gas. The upper limit for the ceiling price was fixed at $450. So, according to the ministry’s proposal, if the cost of producing urea falls below $275 a tonne, the government will still pay the producer the floor price. If the cost rises above $405 without a significant revision in the price of gas, the producer will still be paid $405. But if the price of gas escalates, the floor price-ceiling price range would move upwards to a maximum of $450. Officials said that Planning Commission note also suggests a so-called “gain-sharing" formula to determine the government’s share in profits. “As per the gain-sharing formula, the government would get to keep 40% to 80% of the gains, depending on where the cost of manufacturing urea lies within the floor-ceiling band," said the first official cited above. The floor and the ceiling prices have been pegged on an import parity price (IPP) basis. IPP is the price determined for a domestically manufactured commodity that is equated to its import price. Officials said that as per the Planning Commission’s proposal, while for greenfield projects, the cost of urea produced would be recognized at 100% of IPP, for existing units, additional urea produced after capacity enhancement would be recognized at 92% of IPP. As per the current policy, the figure for existing units is 85%. Under the current regime, the government fixes the price at which it buys urea from producers as well as the maximum retail price (MRP) to be paid by a farmer, which is typically lower than the producer’s price. The government fills in the gap with a subsidy. The government is also in the process of finalizing a policy for deregulating the MRP of urea. India’s last greenfield urea project was set up in 1995. A number of greenfield and brownfield expansion projects have been delayed as investors await the new policy framework, Mint reported on 6 October. The industry is not enthused by the Planning Commission’s proposals. “Unless you deregulate urea prices, no new investment will come up," said the managing director of a fertilizer company, asking not to be identified. “Moreover, the floor and ceiling price of urea must be linked to gas price," he added. The second official cited above said the Planning Commission note, along with the ministry’s own proposal would be taken up on a meeting scheduled for 3 November.